Though lesser known that Nikon and Canon, Pentax holds its own when it comes to producing quality DSLR cameras. It has fewer camera options than the two big names, but that doesn’t mean they skimp on quality. Actually, Pentax’s lineup of DSLR cameras is pretty impressive. In this guide, we’ll take a look at the current (RIP K-50) lineup of Pentax DSLR cameras. The K-S2 is one of the Pentax entry-level DSLRs, and it has some pretty impressive additions that make it hard to resist. The image quality of the K-S2 is excellent, and the video function and features make it a bit more competitive compared to some of the other entry-level DSLRs with similar pricing. The viewfinder and vari-angle LCD are other sweet perks of this camera, making it a worthy choice for a beginner. It is a small camera, but we like the control layout overall. 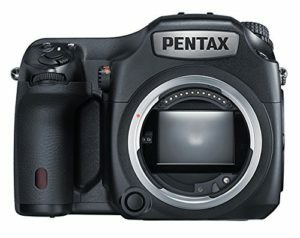 K-S2 also features built-in Wi-Fi, making it the first Pentax DSLR to do so. The camera is responsive and quick, with nice quality and an appealing design. If you’re into options, you’re in luck. The K-S2 comes in colors other than black. 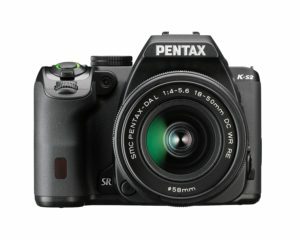 Bottom line: If you are considering Pentax for your first DSLR, the K-S2 is a solid choice. 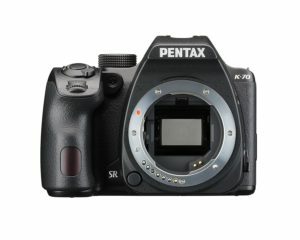 The other entry-level option from Pentax is the K-70, which is slightly more expensive than the K-S2 and billed by some as a mid-range DSLR. The K-70 gives you great value for the money. It’s also set up with advanced weather sealing, and combined with its abilities makes it great for outdoor enthusiasts. It’s also dustproof and cold resistant. It is a very compact DSLR, so, again, it seems to be a smart choice for nature lovers. In terms of performance, the K-70 has excellent image quality and great high ISO performance. It provides a ton of features, making it great for someone with at least some experience with DSLR. It does have built-in Wi-Fi, though it is a little slow, and the battery life isn’t stellar. The articulated screen is a nice addition, and the new live view hybrid AF system elevates it a bit above many competitors. We have to say it up front: one of the coolest things about the K-3 II is its ability to do astrophotography. The GPS and AstroTracer help you capture star trails quickly and easily. But there’s a lot of other things to love, too. The K-3 II is a fairly complex DSLR – definitely not for beginners – but the additional features and functions make it an incredibly versatile mid-range camera. The body and monitor design highlight the fact that this is designed for serious photographers. There are no scene modes, and it’s completely weatherproofed. Overall, this is an exciting offering by Pentax, especially given the price point and its ability to do neat things (we’re really very excited about the astrophotography). The K-3 II will make a great second DSLR for the enthusiast looking for more challenges and a broader range of options. 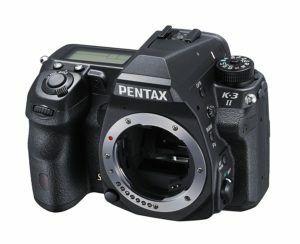 The Pentax KP is very closely priced to the K-3 II. However, it has some significant differences that make it a very different option for photographers considering a new mid-range DSLR. The differences in the KP are in the max ISO, the stabilizer, and built-in Wi-Fi, which the K-3 II lacks. The KP has the weatherproofing technology, too, but it is a bit lighter than the K-3 II. The KP has a more customizable interface and some other changes in design as well. On its own, the KP has some great specs, and the image quality is excellent. It also features excellent ISO noise control and a tilt-angle screen. 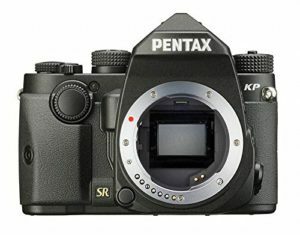 Overall, the KP has some outstanding qualities that make it a good pick for Pentax fans. It also has enough differences in design and functionality that it should be easy to decide between the KP and the K-3 II. Pentax’s full frame option is the K-1 – a full frame sensor with image stabilization. It’s well designed with photographic capabilities in mind. Like the K-3 II, the K-1 is set up for astrophotography. You can bet that with the rest of these specs that the images will be high quality. The all-weather body is another perk (though it is to be expected, given the weatherproofing on the other models). The viewfinder is bright and accurate, too. While it’s a bit heavy, it is compact with great ergonomics. It’s comfortable to hold for long periods of time. The LCD monitor is truly remarkable, and it features a unique articulation mechanism. With 36 megapixels, it’s competitive alongside similarly priced models. 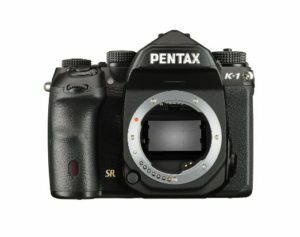 There’s a lot to be excited about in the flagship K-1, and well-priced for a Pentax fan looking to take things to the next level. The medium format Pentax 645Z is a favorite among many professional photographers. In fact, it earned a spot on our DSLR guide as one of the best professional DSLR cameras. There’s not a lot to say about this beast without a full review – it’s highly technical, and the price point makes it out of reach for many of Pentax’s primary consumers. However, if you are looking to add a professional grade camera to your bag, keep this one high on your list. There is a reason why the Pentax 645Z ranks so highly among pros.